Adventure Time gets the Mimoco treatment as a brand new series of the collectable flash drives hit just in time for the San Diego Comic-Con. If you've ever picked up one of Mimoco's Mimobots before, then you know how awesome the little guys are. These flash drives (which come in sizes of up to 64gigs) have been produced in loads of different styles and brands (my favorite are the artist series') and now they're available in one of the most popular cartoons in recent history - Adventure Time! "Mimoco is thrilled to be entering the Land of Ooo with our new series of Adventure Time MIMOBOT flash drives," says Scott Seraydarian, Director of Media at Mimoco. "Adventure Time's vivid and endearing world fits right in with the MIMOBOT sensibility, and we're excited to be one of the first to bring these awesome characters into the real world. As Finn would say, these guys kick digital Bootay!" 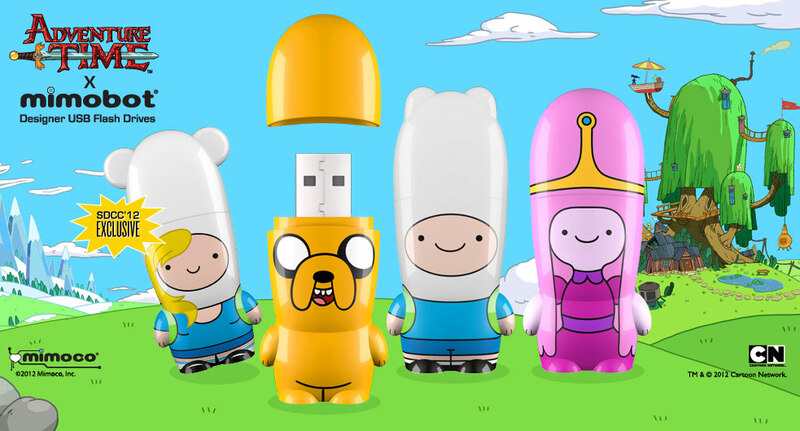 Available in the forms of Finn, Jake, Princess Bubblegum, and Fionna; these drives are not just cool to look at, but are packed with digital extras for fans of the show. Full episodes, soundbites, and the Mimobot suite, which is a desktop customization pack, is pre-loaded onto each drive. And just a note for anybody who might be trekking down to the SDCC- the female Finn (Fionna) will be a show exclusive and will be limited to just 500 pieces. I'd finish this off by telling you that you'd better grab a ticket now if you want one, but Comic-Con has been sold out for months... so... yeah.